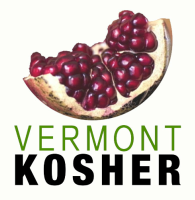 Rachel Jacobs is Vermont Kosher. Living in Israel until 1992, Rachel claims never to have cooked until she was married and then (when hustled off to Vermont) had no alternative. The second oldest in a family of eight children, Rachel grew up assuming everyone made couscous like her mother, by hand. And wasn’t everyone’s grandmother a pastry chef from Morocco? ​One must pick one’s parents carefully!